WILLIFORD - Mrs. Velma Louise Byram, 89, passed away Wednesday, July 25, 2018 in Williford, Ark. She was born Saturday, March 2, 1929 in Savannah, Tenn. to Carl and Ocie O’Neal. Velma married Rev. Bill Byram and they enjoyed 49 years together until his death in 1994. Mrs. Byram was a former employee for the Singer Company in Trumann for over 30 years. She later became Grandma to numerous children working at Ms. Ruth’s Day Care Center in Trumann for several years. She loved seeing the children she took care of grown up and visited with them reminiscing about their childhood. For several years, Velma finished her working career doing demos of food for stores in local areas around Trumann and Jonesboro. Velma knew and loved many friends that she would visit with during her work days. She was a dedicated pastor’s wife for over 30 years. As a devoted church member of the First United Pentecostal Church in Trumann, she continued many of her life long friendships attending church regularly. Velma was a devoted mother and grandmother. She raised her kids as a working mother and pastor’s wife and never faltered on any of her home duties and always made sure her family had everything they needed. Velma is preceded in death by her husband, Rev. Billy Byram; one son, Billy Wayne Byram; two sisters, three brothers and her parents, Willaim Carl and Ocie Morton O'Neal. She is survived by one son, Bobby Glen (Becky) Byram of Williford, Ark. and two daughters, Beverly Gail (Kelly) Major of Cotter, Ark. and Judy Delene (Eddie) Webb of Collierville, Tenn.; three sisters, Sherry Rushing and Betty Smith, both of West Memphis, Ark. and Peggy Littleton of Texarkana, Ark. She had seven grandchildren, nine great-grandchildren and three great-great-grandchildren. Velma will be greatly missed by a host of family and friends. 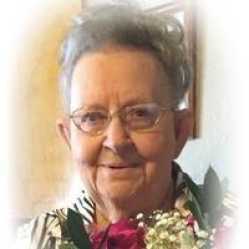 A service to celebrate Velma's life was held July 29, 2018 at the First United Pentecostal Church in Trumann with Rev. Murray Ray and Rev. Ricky Hart officiating. A private family burial was held at the Nettleton Cemetery in Jonesboro, Ark. on July 30, 2018. Pallbearers were Timmy Byram, Bob Byram, Koda Smith, Zachary Webb, Bobby Byram, III, and Billy McCune. Honorary pallbearers were Dustin Osment, Dillon Osment, Austin Byram, Josh Byram, Robert McCune and Brandon Byram. Memorials can be made to the First United Pentecostal Church or charitable organizations of choice.